Whenever I serve these tuna tacos to friends, I always get requests for the recipe. It requires a bit of setting up, but you can put it together right before serving to your guests…or yourself. I use sushi grade tuna for this dish, which is easily found in small frozen “bricks” at Whole Foods or similar stores. Combine the topping ingredients in a bowl, and place it in the fridge. Mix the marinade ingredients in a separate bowl. Chop the tuna into ¼-inch cubes, and marinate it in the soy/oil mix for just 10 minutes, then drain. (It will be really salty if you let marinate any longer.) Keep it cold! Just before serving, take a tortilla chip, place 1 tablespoon of the tuna on top, top this with ½ teaspoon of the sour cream mixture, and then garnish with the finely chopped scallions. Serve them immediately, and eat these quickly, before the tuna makes the tortilla soggy! Make the topping in a bowl first, and place in the fridge. Mix marinade ingredients in a separate bowl. Chop tuna into ¼-inch cubes, and marinate in soy/oil mix for just 10 minutes, then drain. Keep it cold! 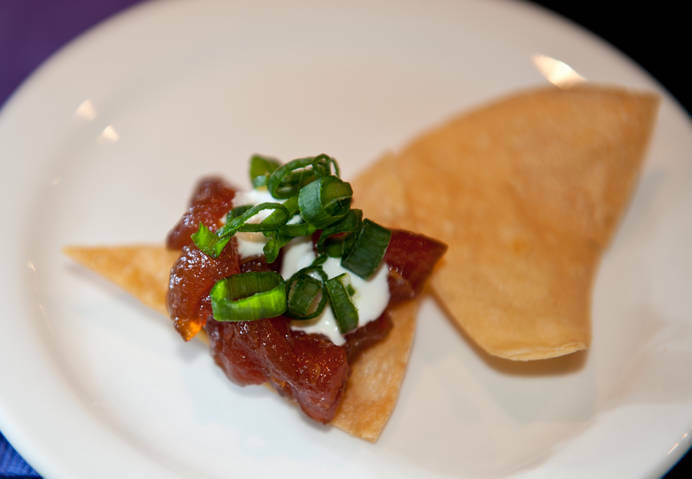 Just before serving, take a tortilla chip, place 1 tablespoon of tuna on top, top this with ½ teaspoon sour cream mixture, and garnish with chopped scallions. Eat these quickly, before the tuna makes the tortilla soggy! Brining, the process of letting a hunk of protein soak in a salt solution for a few hours, is a great way to add flavor and moisture to any cut of meat. 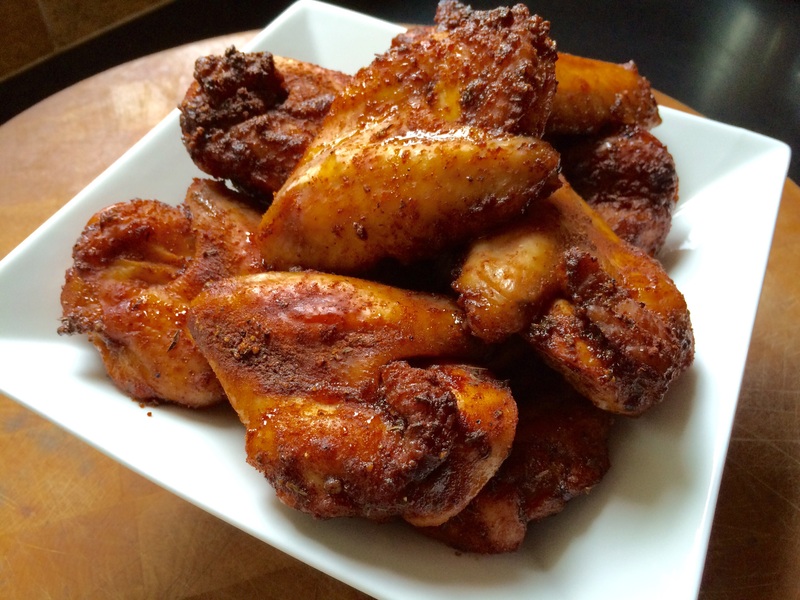 I brine these wings for 3 hours before using a sweet and spicy rub. They can be grilled or roasted in the oven. Place 3 lbs. of chicken wings in a Ziplock bag and pour the cooled brine into the bag. Place the bag in a bowl to prevent leaks and place in the fridge for 3 hours. After 3 hours, remove the chicken from the brine and dry with paper towels. Discard the brine. Place the chicken pieces in a large bowl and sprinkle with 1/3 cup of the rub, tossing to coat the chicken well. Place the bowl with the chicken in the fridge until ready to cook. Toss the chicken with some more of the rub, if you like, then place the pieces on a sheet pan lined with non-stick aluminum foil. Bake at 350 for 30 minutes or until done. Lower oven temperature if it starts to burn. If grilling, cook over medium heat, turning frequently to prevent burning. Cook until the wings are done. I prefer to use sushi grade tuna for this dish, which is easily found in small frozen “bricks” at Whole Foods or similar stores. Make the Topping in a bowl first, and place in the fridge. Mix marinade ingredients in a separate bowl. Chop tuna into ¼-inch cubes, and marinate in soy/oil mix for just 10 minutes, then drain. Keep cold!